Normally our devlog posts at the beginning of the month are reserved for general development progress and gameplay systems, but Spencer and I wear many hats here at Random Seed Games and I've actually been working on some art related stuff over the last few weeks in preparation for our first survival sandbox map design. We want to make the survival mode a unique experience from the story mode that will come later. 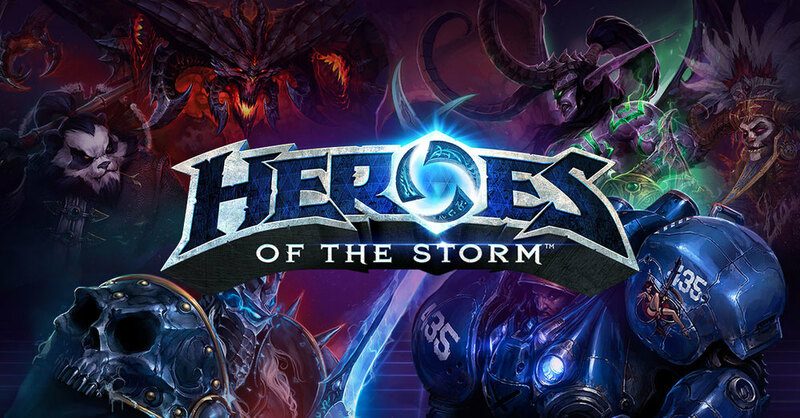 So that means a unique map on release, and hopefully multiple unique maps over time. I decided that this would be a perfect time to revisit one of the most criticised aspects of our terrain... the rocks and cliffs. The NASA data that we use for our terrain generation is incredibly helpful for creating basic formations, but there are some definite limitations. 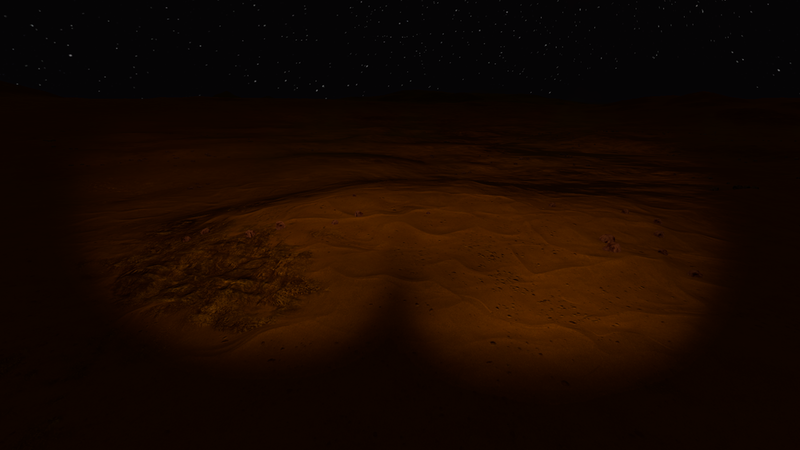 The data resolution and the inability to create overhanging rock formations combine to make the terrain look like a continuous flowing surface without many rugged features. 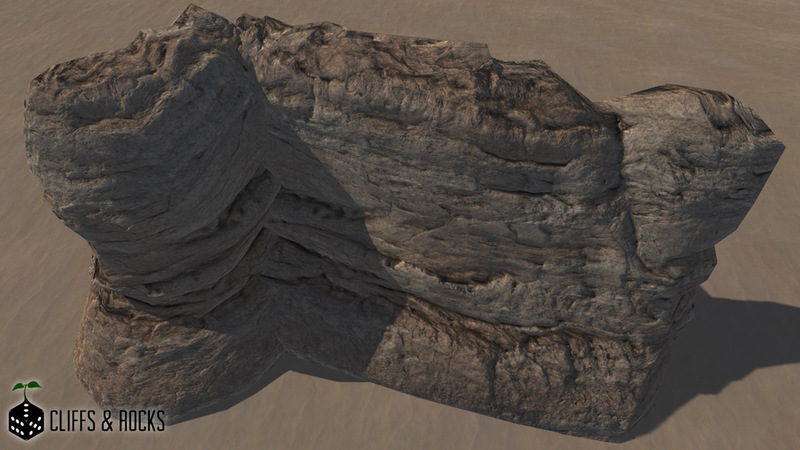 To combat this we need to create rock meshes that protrude from the surface and form more realistic cliffs, etc. 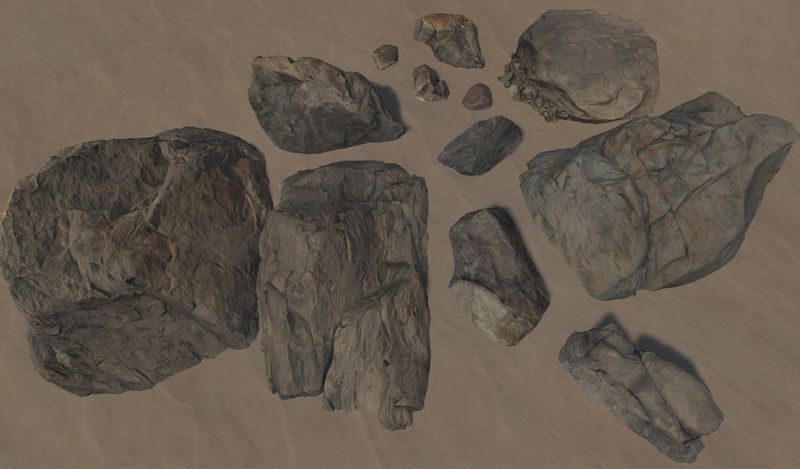 In the past we have relied on the Unity Asset Store as much as possible for rock models, but for cliffs we had difficulty finding appropriate models. 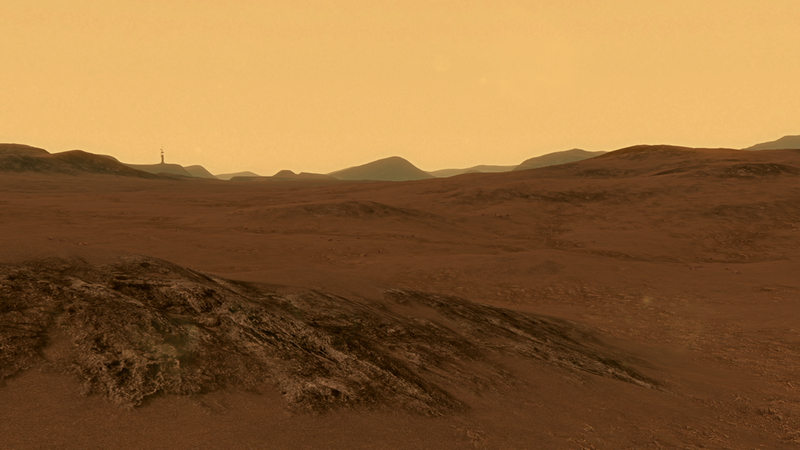 So I spent some time this month creating my own cliff models using real Mars cliff photos as reference. 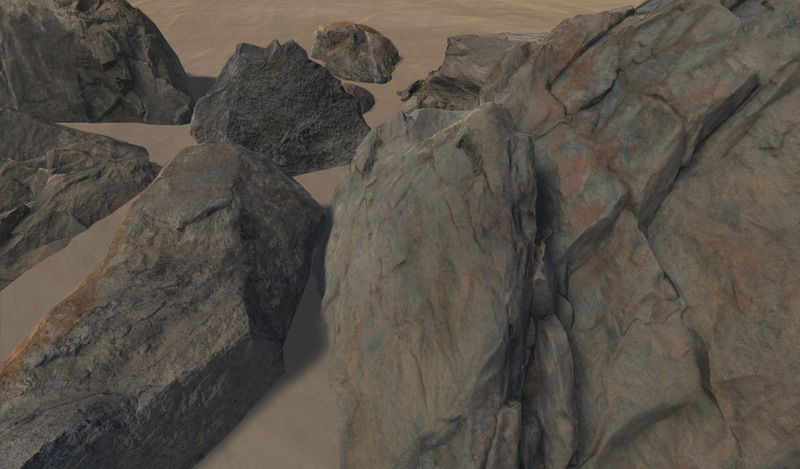 During the creation process I realized that these models might be useful to other developers working on desert environments or planets, so I packed everything up and posted it on the Unity Asset Store for $25. Each variation began as a uniform model which was modified by extruding the vertices using a heightmap generated from a high quality texture. Then each unique model needed to be optimized and adjusted to hide the texture seams as much as possible. Ultimately this provides us with very similar "building blocks" that combine perfectly to create larger formations. The end result looks great, especially at very large scales where the repetition is more easily hidden. 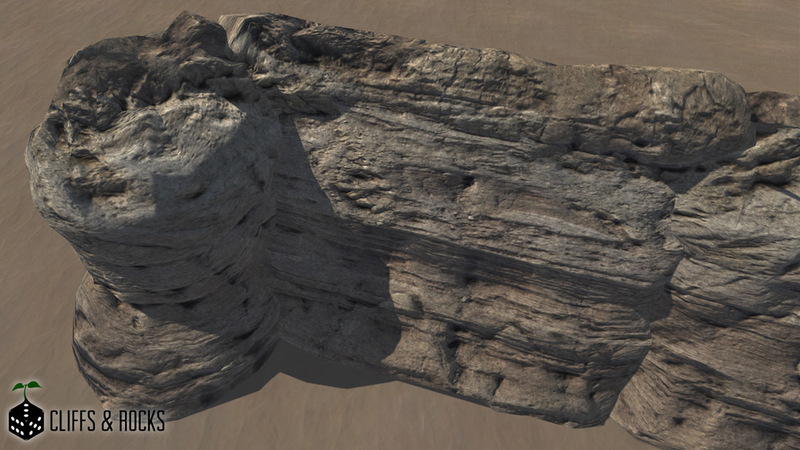 So if you are a developer or know someone who needs some realistic cliff models/textures you should check out our Asset Store page. Additionally, we are still relying on some other Asset Store packages to supplement our own terrain assets. We did manage to find one set of cliff models that will work for us, but we had to make some significant edits to make the meshes modular and lower poly. The package also contained some really high quality rocks that will look great strewn around our terrain. After working to match these rocks and cliffs with our own we feel much better equipped to start building our survival sandbox terrain. 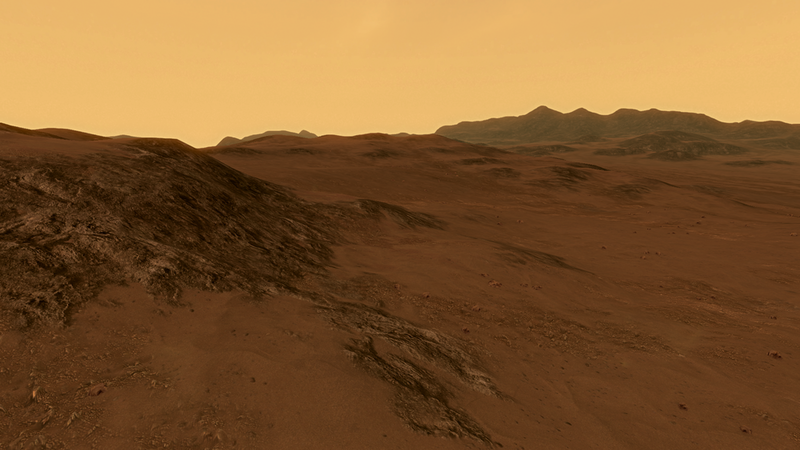 More recently we have also started investigating a new terrain shader in order to further improve our terrain quality. Our old terrain shader is a heavily modified version of an Asset Store terrain shader and it is having issues now with the Unity 5 physical rendering changes. 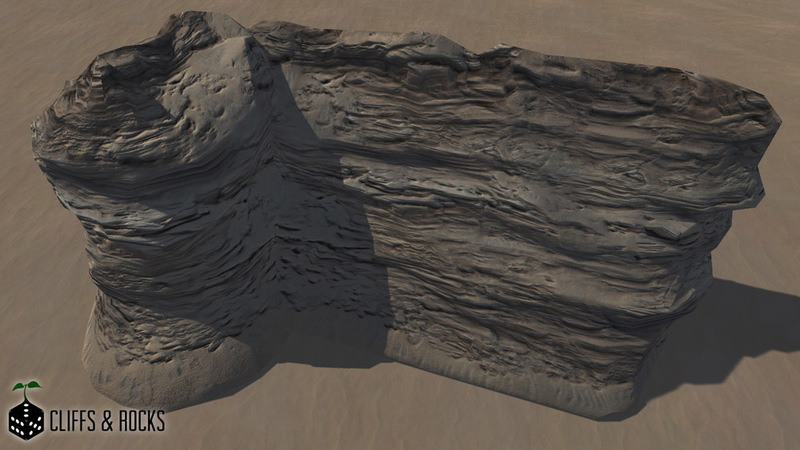 This new Relief Terrain Pack shader may be our best option, and after some early tests it may actually improve our workflow for terrain creation overall. We don't have any screenshots of it in action for Lacuna Passage yet, but to get an idea of what's possible with the RTP shader check out the video below. November has been a busy month for art development. The rest of December will now be devoted to building up the survival sandbox map design version 1.0 and populating it with randomized elements that will make every survival mode playthrough a new challenge.